The touchscreen also known as the Navman digitizer, this replacement part is used to read touchscreen input from the stylus. 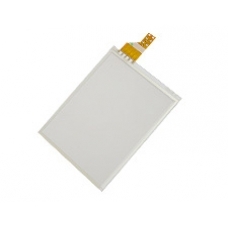 If your touchscreen (digitizer) is cracked or does not respond to stylus input anymore but the screen image is still complete, this is the correct spare part you need to restore your Navman PiN 570 screen to full working order. If you are not confident with a 'Do it Yourself' installation of this spare part, just follow the Related Products link below and order the in-house Navman repair service. If you have broken or cracked touchscreen (or glasstop) of your Navman GPS PDA but the LCD display underneath is intact ..